The history of Royal Enfield is simple: build a bike, then add a motor. Mankind's urge to travel farther, faster has taken the Royal Enfield brand name on a curious, circular journey. Founded in England to make bicycles, it added motors to the bicycles and went on to earn its greatest reputation making motorcycles, first in England and, now, in India. Along the way, an almost unrelated line of Royal Enfield bicycles, manufactured in Asia, were sold in the U.S.
Inevitably, some of these Asian bicycles have been motorized, creating vehicles that might have been recognized by the early factory workers in Redditch. Reader Jeffrey Baker pointed out this ad, on CraigsList, for one of these U.S. market bicycles, which date from the 1980s, equipped with a tidy looking motor. 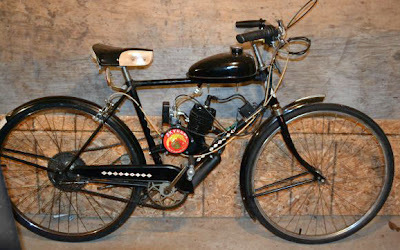 This English style motorized bicycle is for sale for $450 in Uxbridge, Mass. The seller writes that he would be willing to trade for a motorized helicopter! "To meet the strict 2008 US EPA/CARB importation restrictions, all SkyHawk motors are now equipped with a catalytic converter exhaust muffler which incorporates a Palladium Cartridge filter imported from Germany." The tank is black powder coated, with internal chrome plating. The fuel valve is brass instead of the more common aluminum, the company boasts. Just as comforting is the promise that assembly instructions come "in clear English." In a burst of transparency, the company identifies its motor as a true 66cc, although it is in the category of Asian motor normally sold as 80cc. The difference, it explains, is that "in the East, the displacement of an engine includes the area of the cylinder head's combustion chamber as well as the volume of the cylinder. In the U.S. however, the volume of the cylinder is only considered when identifying engine displacement." Cost of the bicycle engine kit is $225. Spooky Tooth says it will deliver 150 miles per gallon, and speeds of 19 to 45 mph depending on gear ratio.